MPs have voted against a proposal to delay Brexit in order to prevent the UK leaving without a deal. The amendment had been put forward by Labour MP Yvette Cooper, but was rejected by 23 votes. MPs are voting on changes to Theresa May’s Brexit plan before she seeks a re-negotiation of it with the EU. The prime minister has urged MPs to back another amendment that would propose “alternative arrangements” to the controversial Irish backstop plan. The backstop is is the insurance policy in Mrs May’s plan to prevent checks on goods and people returning to the Northern Ireland border, which some MPs fear could leave the UK tied to the EU’s rules indefinitely. It was a key part in seeing her original Brexit deal voted down in Parliament by an historic margin earlier in January. Mrs May said she knew there was a “limited appetite” in the EU for changes to the deal, but she believed she could “secure” it. She had phone calls with key EU leaders throughout the day ahead of the Commons votes and has already spoken to the President of the European Commission Jean-Claude Juncker and the Irish Taoiseach (Prime Minister) Leo Varadkar. But the EU has said it will not re-open negotiations and change the legal text agreed with the UK PM. MPs are currently voting on an amendment put forward by Tory MP Caroline Spelman and Labour MP Jack Dromey with the aim of preventing a no deal Brexit. Three amendments – tabled by Labour leader Jeremy Corbyn, the SNP’s Westminster leader Ian Blackford and Tory backbencher Dominic Grieve – had already been voted down by the House. You can read the detail of all the amendments here. Mr Corbyn’s amendment was voted down by 327 votes to 296, Mr Blackford’s only saw 39 votes of support, compared to 327 votes against, and Mr Grieve, who wanted MPs to be given six days to debate Brexit alternatives, lost by 321 votes to 301. This was followed by Ms Cooper’s, which lost by 321 votes to 298, and one by Labour MP Rachel Reeves – also trying to postpone Brexit – which lost by 322 votes to 290. There are two more amendments to be tabled that could be voted on – including one from Tory MP Sir Graham Brady, calling for an “alternative” to the Irish backstop, which Tory MPs have been ordered to back. 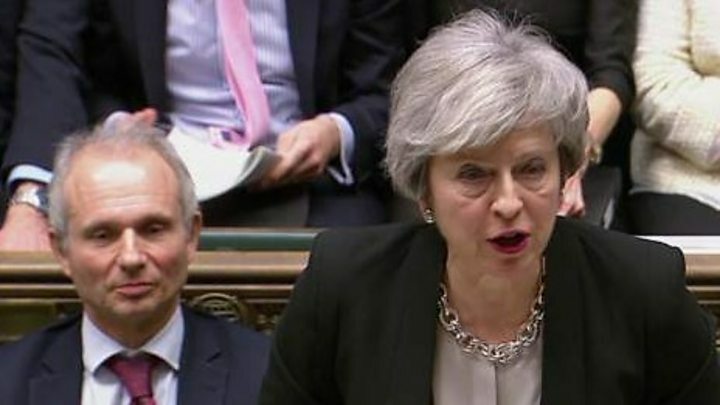 Mrs May earlier appealed for the backing of the “Brady” amendment, saying it would “give the mandate I need to negotiate with Brussels an arrangement that commands a majority in this House – not a further exchange of letters, but a significant and legally binding change to the withdrawal agreement”. And the pro-Leave European Research Group, led by Jacob Rees-Mogg, has said it will vote in favour of Sir Graham’s amendment. If MPs back Sir Graham’s amendment, it could pave the way for a plan known as the “Malthouse Compromise”. Engineered by both Leavers and Remainers, the proposal includes extending the transition period for a year and protecting EU citizens’ rights, instead of using the backstop. Mrs May also promised MPs the votes on Tuesday would not be the last chance for them to express their views over Brexit. She said that if no new deal is reached by 13 February, she will make a statement to Parliament that day and table an amendable motion for debate the following day, re-opening discussions on how to move forward with Brexit. The excitable interventions we’re witnessing in Parliament will convince EU leaders even more deeply that MPs are still very divided over Brexit and that now is not the decisive moment for Brussels to budge. The EU wants to avoid an endless process of Theresa May shuttling to and from Brussels, getting a tweak or two, returning to Parliament, having the deal still rejected, coming back to Brussels and so on. It’s right to think the EU sometimes insists one thing, then does something rather different. But the Irish backstop is a hugely sensitive issue, painfully co-negotiated over months with UK negotiators and almost impossible to fudge (as the EU prefers to do in difficult situations). EU leaders are unlikely to touch the conditions of the backstop until a no-deal Brexit is well and truly staring them in the face. And even then they are unlikely to entertain changes unless Dublin is on board. We’re nowhere near there yet, if we ever get there.